It’s time to hit the beach. If you’re thinking it’s too far, too expensive, or you just don’t have the time, then you’re allowing the roadblocks of life to get in your way. If you truly want to free your mind, body, and sprit and live a fulfilling life, then how about breaking through those barriers?Very few people really live life; most of them just attempt to survive. When you think of the beach, you might think about nothing more than a wide expanse of sand followed by a massive stretch of sea. However, if that’s the case, then you’re not looking at the beach for what it really has to offer. The beach isn’t just a place; it’s a sanctuary for the human spirit. Regardless of what’s taking place in the world or the stresses you must contend with in your personal life, the beach will always be there, patiently awaiting your arrival so it can provide you with what you need – a refresh for your body, mind, and spirit. Why do you think so many people love the beach? Sure, it’s scenic, but there’s something deeper. It’s not often that someone returning from the beach indicates they had a bad experience. In the vast majority of cases, they state how great it was and how they can’t wait to go back. But why is that? What does the beach offer that makes it so special? Let’s cover the obvious aspects first. Of course, some people will visit the beach to sunbathe, read a book, people-watch, and just relax. This in itself can be very rewarding. If one is wise, then they will leave their smartphone in the car, or at least turn it off. Simply by relaxing at the beach, you’re allowing your mind to reset, and in a way, you will feel as though you have been taken back to a simpler time. You will also realize that simplicity is beauty, especially when it comes to natural settings. Then there are those who are a little bit more energetic. And while the beach isn’t really known for its sports other than surfing, it’s actually an outdoor enthusiast’s paradise. One popular activity that has withstood the test of time is beach volleyball. Think back to when you were a little kid. If you happened to visit a beach at that time, then you probably noticed volleyball net. If you were lucky, then you might have even witnessed a game or had the opportunity to play in one. The best part about beach volleyball is that you don’t need to be a professional. Everyone is welcomed. It’s more of a social activity that takes place on the beach, which then leads to the forming of new friendships. This, in turn, leads to the sharing of ideas and time spent. 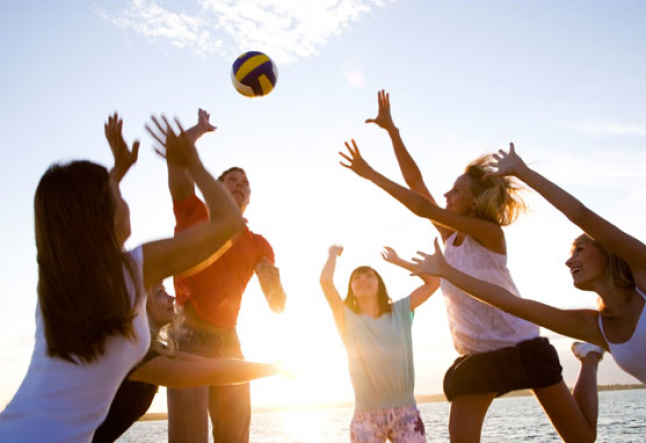 Friendship is one of the beauties of life, and to think a beach volleyball court is the location for the forming of some of these relationships is somewhat shocking to people. However, in this environment, there is no alcohol, stress, or borders. It’s the ideal location to meet someone new – as a friend or perhaps even a partner. If you’re not much of an athlete, it’s okay. The most popular sport at the beach today doesn’t require athleticism. In fact, it’s the easiest sport imaginable. At the same time, it’s a great workout. It’s called paddle boarding. If you have been near any ocean, river, or lake in the past few years, then you have definitely spotted someone paddle-boarding. And the benefits of this sport go well beyond the physical aspect. Think about standing on top of the surface of the ocean while looking out on the horizon, at the boats passing by in the distance, or back at the land for a broader view of how people live. Standing on the ocean is indeed spiritual. Furthermore, nobody goes paddle boarding and wishes they were at home reading e-mails. Reading e-mails and searching for information on the Internet is something we do to stay connected with others, which is a net positive, but it’s not truly living. Paddle boarding, on the other hand, is indeed truly living. Then there’s surfing. Surfing is widely known as one of the most spiritual sports on earth. To ride something that nature provides is a special experience. The best part is that even if you’re intimidated by it, you can still enjoy it, just in a different manner. Instead of surfing, you can go boogey-boarding. Rather than standing, you will be lying down, but you will have just as much fun. And if you’re truly connected with your inner self and free of ego, then you won’t care what others think. Most people who boogey-board are kids, but there are no rules against adults participating. Be free, be different, have fun. If you would prefer to stay dry, yet you still want to do something active that doesn’t include a sport like volleyball, then you can build sand castles, search for shells, go for a walk along the edge of the water, or write messages in the sand and take pictures of those messages so they will last forever. One thing many people overlook about the beach is what it offers at nighttime. The vast majority of people believe it’s not possible to visit the beach at night because public beaches close at dusk and private beaches are off limits. Part of this is true, and trespassing is never a good idea. However, there are some public beaches that remain open at night. You might have to drive a little further than you intended to reach your destination, but like anything else, if you look hard enough, you will find it. And it’s certainly worth the effort. If you’re looking to really connect with other people, then consider setting up or attending a campfire on the beach. These majestic settings offer a completely different type of beach experience, where it’s more about the people than the surroundings. The surroundings – gently crashing surf, bright stars in the sky, no noise pollution – are powerful thanks to their minimizing effects of modernization, allowing you and others to focus on each other opposed to external distractions. This is why storytelling is so popular around a campfire. These don’t need to be stories where you have to reach down deep and think of something clever. They can be simple stories about what you did last week, or last year. Then again, stories aren’t always necessary. While beach campfire stories are certainly interesting, these days someone will want to set the mood with quality music. And a lot of people are digging in to new indie music to find new and unique talents to provide that music. Whether it’s books or music, more and more people are turning to new talents so they can enjoy something that provides a breath of fresh air. In many cases, this falls into that category. It would be nearly impossible to play beach volleyball, go paddle boarding, enjoy boogey-boarding, go for a walk on the beach, look for shells, and connect with others while sitting around a campfire and enjoying new music. Then again, why not? Knock down those barriers. What is CBD oil and does it work? An exclusive interview with Finland born entrepreneur, raw food chef, and now a restaurant owner, Pauliina Salmenhaara. LOOK WHO IS “DOING IT" WRITING ABOUT HEALTH!